Time for some portugal chow. 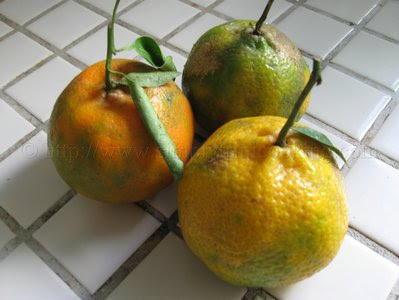 Just like the Topi tambo this week, Portugal (pronounced po-ti-gal) is in season here in Trinidad and Tobago. 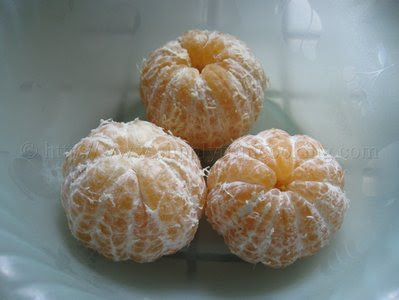 Portugal (a variety of clementine) is grown in large fields like other citrus fruits like orange and grapefruit, and is perhaps the most enjoyed because of the ease in peeling it with your bare hands. 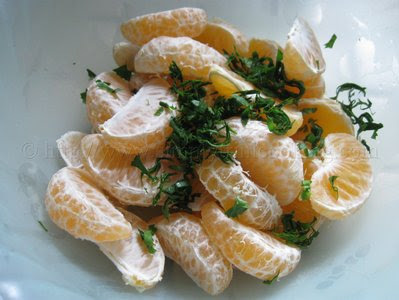 Besides that, the portugal is also rich in fibre, antioxidants and vitamin c.
The portugal is easily peeled with the hands to reveal neat semi circular ‘pegs’ (our trini term) or segments (usually there are about 7 to 14 ‘pegs’). The juicy ‘pegs’ can be eaten or squeezed to make juice, but I believe one of the most popular ways is to enjoy portugal in Trinidad is in the form of a chow. As said before we Trinis can take almost any fruit to make a delicious chow, such as mango, pineapple, pommecythere and cucumber. When I got a bag of Portugal the other day, a chow was the first thing that ran through my mind to make.The pepper, garlic and of course chadon beni together with the tart citrus flavour of the portugal can make you salivate instantly. I should know It always happens to me….Actually it’s happening as I write :-). I can taste it already. 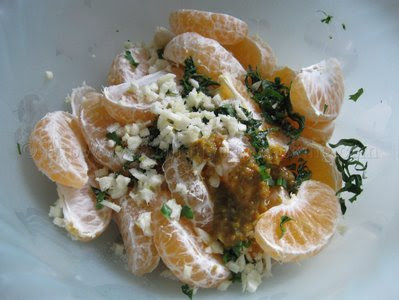 So here for you today is another wonderful and delicious recipe Portugal Chow: simple, delicious and unmistakeably Trini all over. Enjoy. 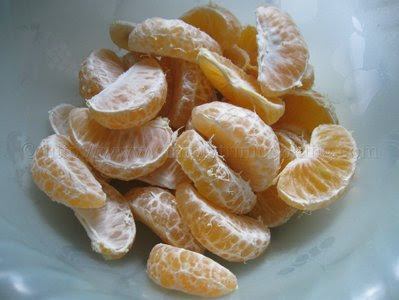 Wash and peel the portugals. Place in a bowl. garlic, pepper and salt to taste. Add about a 1/4 cup of water for sauce and toss. See how easy that was! There nothing to it. 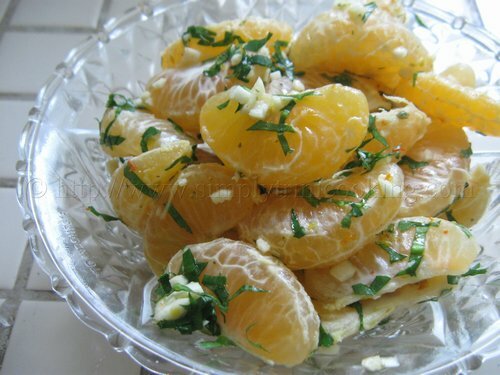 If you want you could add a bit of variety by using other citrus fruits and adjust the “seasoning” ingredients to suit. Coming up next…What’s coming up next? Oh it’s the weekend. See you on Monday same place, same time. Ah gone, but doh move ah comin’ right back! Don’t forget to leave your comment on portugal chow in the comment box below.